Remember that transmission line that's been held up for years and years because the government can't resolve any issue in the Caledonia area? 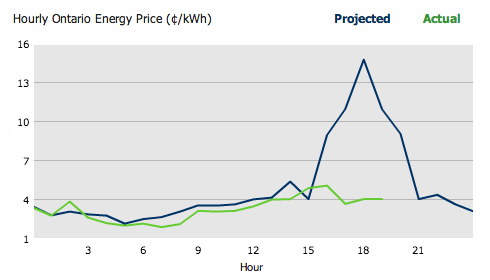 Well, today as Ontario prices for electricity remained low ($40/MWh range), while the zone of the New York system the line would strengthen saw prices surge - and that will probably happen for the next couple of days too. Real-time power prices in western New York continued to soar Monday, breaching the $2,500/MWh mark shortly before 3 p.m. EDT in West A zone as high temperatures continue to drive up demand. Demand in the NYISO footprint was around 32,888 MW, which is about 1,000 MW higher than the grid operator had expected in its day-ahead forecast. Peak demand is projected to reach 33,300 MW Monday, about 600 MW just shy of the all-time record.